hypocrisy has no levels and no age bar...hypocrites are the people who who suffer ..from superiority complex pretending to have virtues and principles which they actually don't posses . its surprising how people put blame on others and show frustration as to they have to face the trouble times..these people never take responsibility but want only appreciation Cuz They think they are born for that!!! When somebody shows them the real picture and results of their mistakes they feel like hitting everyone sitting there,as they are source of embarrassment for the family now...though nobody says anything to them but its the inner guilt of that person that brings a frown which is clearly visible. ..The immigration people came to know and ...then he was deported ...Before leaving ..he said "I am very happy to go back to my country..I will enjoy and spend quality time now with friends ,there is no problem of money as off I we have people working for us.. we are our own boss...its a boon they are sending me back"
I was surprised ...people in the crowd smiled at each other..To me it appeared.."grape are sour"
He left ...his wife and only son stayed back..and filed his papers for immigration But he declared ..I don't wanna come back..
...After some time we heard ..he is very happy in India and doin well.....he had enough help back home and this made him comfortable. Any ways we welcomed him back regardless of the taunts and disrespect he showed towards other people last time. Thali ke baingan, I would say. They change stance and ideology depending upon the situation. You have rightly said about hypocrites. My good wishes on NAVRATRI. regarding US.its always like that saying in Hindi..shaadi ka ladoo jo khayae woh pacchtaaye aur jo na khaaye woh bhi. its very difficult to feel complete anywhere,.even I.when in US miss India and when in India miss US,nevr at complete peace anywhere...so I think both countries have their own pros and cons. he he he he Beleive me I have had so many stories ..
jede Desh da khaiye usda bura nahin mangida ..
lolz..a classic example of Ungoor Khuttay hein! yes people do that all the time..they find it a good FACE-SAVING POLICY..and the worst part they dont even get embarrassed when you trap them in their own words! i have seen this attitude too about staying in US..
"Never Leave Anything that You have in hands, otherwise, You will have to regret for it". In Previous Comment : Assume word "You" as "We" or ""Anyone". Like the Indian saying goes "some people are like that only"
Frankly speaking I can't stand such people and make it very clear to them, and in the bargain rub them the wrong way. The problem with them is that they are very self inflated and can't bear it when that bubble bursts. Very well written. We come across different people and ofcourse there are people who are hypocrates and we cannot ignore though its really annoying. I appreciate for your wonderful post. Wish you and your family a very Happy Navratri. Hypocrites are just so irritating. I cant relate to them. I heard this Muhavara after long time..
happy Navratri to ya as well. these kinda people are never satisfied. You know these kinda people have no values ..who insult their own country and the country who feeds them too..
You know bick..its all lies ..a Hypocrisy when they say We hate to go out of India or foreign land..My own relatives left for good to india... And came back after two weeks Saying ..all bad things..I jus dont get it why people are so frustrated..
India we are born and Raised we love our country But we shld respect place we live inn. I have heard that beautiful pnjabi song. ya..it was perfect Example ..
Then I tried my e-mail..window for chatting ..which was kinda ok..seems like load shedding transferred its effects here in USA ..
@UMA..sure ..you wud have also seen these Jerks ..
these are the people who try to be.. Superior ..and think other made wrong decisions ..But they are biggest fools of all times. ..and the whole thing is making other feel that they are fool and cannot understand them. I am surprised by the values they carry and wht they teach their kids. love your poetry..Few words but very powerful. I see all your wonderful dresses and Charisma you carry.. 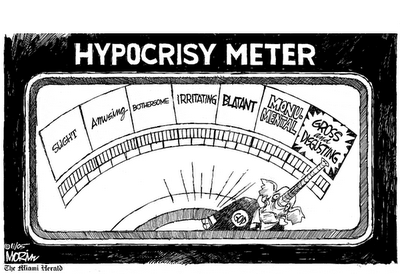 I can't stand Hypocrites! What really annoys me is that they have got the justification for every single thing they say!